On November 17th, 2012, the artistic-political project “Исправляй!Угарай!” (Ispravlyai! Ugarai!) was subjected to political censorship when taking part in the exhibition”The voice of the streets.” The management of the Loft-Project “ЭТАЖИ” (Etazhi) demanded the removal of one of the works dealing with the marriage of church and state. Under these circumstances , we officially refused to continue our participation in this exhibition and removed the remaining works. We believe it is hypocritical to flirt with street that and at the same time engage in political censorship. If the the owners of the loft are afraid of losing their space and censor any statement referencing the current government, then they should openly declare that the Loft Project “Etazhi” is a shopping and entertainment complex and not a space for art. Moreover, this is not an isolated situation among cultural spaces in the city – recently the Rizzordi Art Foundation motivated its refusal to support a previously agreed upon exhibition entitled “Icons,” by citing “the unfavorable situation in the city,” and thus playing up to the most reactionary attitudes in the city. We believe that this state of constant censorship may have been normal in the Middle Ages or in the time of Goebbels, but not in 2012 and in one of the most progressive cultural centers in the world – Petersburg – this is pure nonsense and absurdity, indicative of a turn towards the Dark Ages and neo-totalitarianism. And it also relates to the emergence of these supposed “cultural institutions,” which young cultural producers had always considered independent and open-minded. This statement is primarily addressed to Svetlana Polynkova, deputy director of the Loft Project Etazhi, and to the entire management of the loft. It does not apply to the the collective Public Post or other people who worked on this exhibition and tried to show street art without making it more “soft” than it is. In solidarity with the project Ispravlyai! 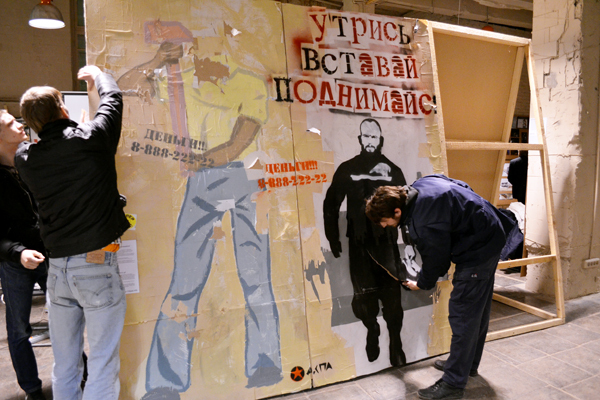 Ugarai!, the Resistance Movement named after Petr Alexeev (DSPA) also removed their works from the exhibition. Also, the Laboratory of Poetic Actionism ( Laboratoriya Poeticheskovo Aktsionizma) and the art group “Bez Aftora” will remove their works in the near future. We encourage other artists participating in this exhibition to also show their solidarity, join our call and remove their works. In the last 20 years of bourgeois-rule in Russia, not only the history of the first state of workers and peasants was half-forgotten, half-erased and soiled, but the very notion of the working class. It has practically disappeared from public consciousness. Generally speaking, the existence of the working class is denied, turning a blind eye to the obvious fact that there are people constantly producing the material wealth around us. Only in Petersburg alone, there are about 300 thousands industrial workers. In Russia they number millions and around the world billions. We are convinced that once the mighty fist of the working class will rise, it will smash the yoke of Putinism into dust, as well as the police batons surrounding it and the whole system of exploitation of man by man. 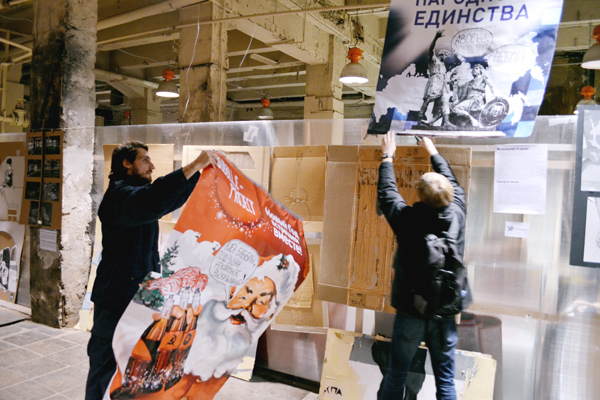 The work hung on display for around a week until the censorship incident happened: the managers of the Loft Project “Etazhi,” where the exhibition is taking place, gave the organizers an ultimatum demanding that they remove one of the works of the collective Ispravlyai! Ugarai!, which depicted Putin and Medvedev. The organizers agreed, stating that “this is too much, explicitly anti-religious motivation” and took down the work. Ispravlyai! Ugarai! reacted against the censorship, released a special statement and decided to stop taking part in the exhibition. The Artistic Cell of the DSPA supports the statement of the collective Ispravlyai! Ugarai! and in solidarity with them also terminated their participation in the exhibition. On Sunday night the activists went into the loft, waited until the end of the workshop taking place there and removed their works. And helped a representative of “Ispravlayi” to also take down their work. The Laboratory of Poetic Actionism (Laboratoriya Poeticheskovo Aktsionizma) and the art group “Bez Aftora” (Without an author) also reacted in support of “Ispravlyai,” declaring that they would also remove their works in the near future. What could be our position, when artists, just like we are, were censored and moreover, when we are not allowed to remove works from the exhibition (by virtue of a so-called mythical contract, which did not prevent the censorship of the installation from taking place anyway)? Only solidarity. During the installation of the exhibition I asked the curator if they had produced our labels, and as it turned out, they were ready but “were being moderated” in the “upper floors” of the Loft-Project “Etazhi”[“etazhi”means floors in Russian] – apparently not such an unassuming, tusovka-like space as it would seem. But the funniest thing was that they agreed to put up our works in the exhibition, which carries such a proud name – “The voice of the streets”… Even then I found all of this quite comical, but the works had already been installed and the exhibition opening was scheduled the next day and we decided to turn a blind eye to these timid bureaucratic maneuvers. However, this type of bureaucratic maneuvering could not get past the innocent banner on which two elderly, unpopular men were depicted [the portraits of Vladimir Putin and Dmitry Medvedev in the above-mentioned censored work], and whose condition the artists decided to immortalize with Russian iconographic motifs. You know what, dear “Etazhi”, both the ones on the upper and lower floors, you have to decide what you want playing in your ears: either the “voice of the streets,” albeit in-between scare-quotes (without these nothing comes to you), or the whisper of self-censorship – which means that you need to drop the scare-quotes and openly say: every such case gravely narrows your and our space of freedom, and the next case of a successful prevention of a multi-floor “disturbance” by a low-level functionary can be invoked as a fact. And in order not to hurt your situation with the freedom of criticism which we have, better yet exhibit the icons as formal portraits: on the first “floor” it is easier, but on the highest “floor” you could show works by those with golden salaries who capture the most “noteworthy faces.” This way it is less dangerous and more commercially profitable. * in Russian “Ispravlyai! Ugarai!” refers to slang for having fun in a very wild, vulgar and strange way. Editor’s Note. Original statements published in Russian here, here and here. The English translation has been edited slightly to make it more readable.